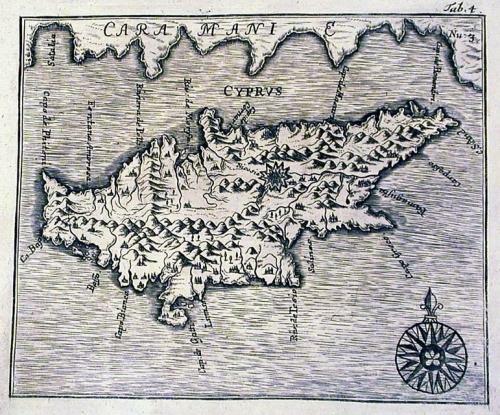 An engraving of the island of Cyprus. Cyprus is mentioned by biblical historian Flavius Josephus as being settled by Kittim, son of Javan, grandson of Japheth (Yefet). From a book by A M Myller recounting his travels from 1725 to 1727. Myller journeyed from Rome to Jerusalem then on to Troy, Gallipoli and Constantinople. From Constantinople he travelled to Egypt and then to Syria. Finally from Syria he travelled to Malta and back to Rome. Scarce.